Our commitment to responsible environmental practices is as much about our iconic status as a leading Australian organisation, as it is about the direct impacts our business has on the environment. We understand that we need to manage our impacts on the environment but doing so helps reduce our costs, manage risks and improve customer value. We view the issue of environmental responsibility as intrinsic to being part of tomorrow. To support our focus on this area, we introduced the new enterprise-wide Corporate Responsibility Strategy in May 2016. Our opportunity to create value lies both in our ability to reduce the environmental footprint of our operations and to use our network assets to create a more circular economy. Australia Post is committed to managing our environmental impact in a way that reduces our carbon emissions and our impact on climate change. In this context, we prioritise our response to climate change and work hard to ensure that our performance is based on reality. We’re committed to understanding the impacts our business operations have on the environment and finding ways to improve. This means minimising costs, better managing our resources and identifying avenues to create value for our customers, our workforce and for the environment. Environmental considerations are embedded throughout our regular business activities, with sustainability requirements integrated into our business cases, as well as being a key criteria in our procurement procedures. As an active and committed member of the National Packaging Covenant since 2005, we focus our efforts on the design, composition and recycling of our packaging. We continue to work with our suppliers to look for ways to enhance the reuse and recyclability of our packaging, as well as increase the recycled content of our packaging materials. We introduced a new recycling program in 2016, encouraging our customers to recycle their plastic mailing satchels. The Australia Post Mailing Satchel Brigade is a new national program with our partner TerraCycle. Customers across Australia can also now post their used plastic mailing satchels for free to TerraCycle, to have them turned into materials that help build recycled products and industrial items. Through our partnership with TerraCycle, we are now closing the waste loop on our own mailing satchels. We are proud of our long-term retail recycling partnership with Planet Ark’s printer cartridge recycling program Cartridges 4 Planet Ark. MobileMuster is another long-term partner, where customers can recycle all brands and types of mobile phones, as well as batteries, chargers and accessories. Since 2008, through our network of Post Offices, more than 245,000 MobileMuster satchels have been returned by our customers. This amounts to 62.6 tonnes of mobile phone handsets, batteries and chargers diverted from landfill. We acknowledge that climate change is one of the biggest threats facing the world’s future, with global emissions of carbon dioxide (CO2) having increased by almost 50 per cent since 1990. The impacts of climate change will be felt by people all over the world, with some of the poorest nations being impacted the most. Action is needed by business, governments and civil society to combat these impacts and move towards a more sustainable future. As part of our commitment to managing our environmental impact, Australia Post is a member of the UN Global Compact (UNGC) – the world’s largest corporate sustainability initiative. The 10 principles of the UNGC provide both a practical framework for action and a platform for demonstrating corporate commitment and leadership. In a worldwide call for action, in 2015 the United Nations launched its Sustainable Development Goals (SDGs) – negotiated in part by our shareholder, the Australian Government. The SDGs provide a new roadmap for achieving global sustainability and development to 2030, seeking to mobilise global efforts around a common set of goals and targets. One of the SDGs is to address climate change. Climate Change Conference, which saw an agreement reached to hold the increase in the global average temperature to well below 2°C above pre-industrial levels and endeavour to limit them to 1.5°C. implementing energy-efficiency upgrades at eight sites to achieve energy and carbon savings of greater than 40 per cent. investigate alternative electricity-purchasing models including aggregated renewable energy purchasing. Our approach is underpinned by a robust environmental management system. This is aligned with the ISO 14001 environmental standard that actively monitors and manages environmental impacts. Australia Post has seen a 6 per cent reduction in total emissions primarily associated with a reduction in electricity, road and air transport as product is moved onto the rail network wherever possible. In November 2015, we were delighted to receive the highly prestigious Banksia Environmental Foundation’s Large Business Sustainability Leadership Award in recognition of our efforts to integrate comprehensive and high-impact environmental initiatives across our business. Our success was a result of our comprehensive and impactful programs across our business. With our unparalleled network of touch points into Australian businesses and communities, we are perfectly positioned to make it easier for Australians to collect and return items that would otherwise go to landfill. As such we set ourselves a target to responsibly divert 100,000 tonnes of material from landfill, by 2020. We continue to transform operational circularity solutions, such as the recycling of truck curtains and tyres into customer circularity solutions, responding to market trends but also through leveraging our own capabilities. In 2015/16, we joined forces with TerraCycle to recycle products from some big brands, including Colgate, Garnier, Maybelline, L’Oreal, Nespresso, L’Occitane and Nature’s Own. With initiatives where people can redirect recyclable waste through the postal and parcels network, we are directing products including toothbrushes, cosmetic items and coffee pods for repurposing. These waste products are melted down and the recycled plastic made into plastic lumber, shipping pallets and railway sleepers. We also continue our long-term partnerships with Planet Ark and MobileMuster, enabling the return of 179,326 printer cartridges and 103,962 mobile phones and accessories. In 2016, Australia Post recycled and reused 12,531 tonnes during the first year of our target from a combination of customer and operational programs. Australia Post has set a target for 2017 to increase the level of recycling by an additional 1500 tonnes, focusing on textiles and internal reuse programs. Transport is a focus area for environmental improvement and we continue to look for ways to become more efficient and adopt alternative fuels across our transport fleet. We are starting to see great results through a number of new initiatives including our purchase of fuel-efficient vehicles, using an extendable conveyor to “loose load” parcels directly into transport containers on selected routes, improving container storage capacity. We are also partnering with Renault Australia, to assess Australia’s first fully electrically powered commercial van – the Renault Kangoo Maxi ZE. We expect to halve energy costs, along with the 100 per cent reduction in carbon emissions. Energy use in our buildings and facilities accounts for around two-thirds of our carbon emissions. Our employees and contractors are always looking for innovative ways to improve energy efficiency across our network of Post Offices, mail facilities and administrative offices. We conduct a dedicated energy-efficiency audit program and use a research and development fund to trial and evaluate idea. As well as identifying and implementing more efficient lighting systems as part of our repair and replacement program, we monitor, measure and influence the impact of our IT infrastructure, including data centres. One of the most effective ways we manage our energy efficiency is by integrating sustainable design principles into our Building Design Standards, to guide our property development and construction activities. Australia Post is part of a group of organisations looking to drive investment in renewable energy through the Melbourne renewable energy project, using a group purchasing model to buy at large scale. Led by the City of Melbourne, the project includes Australia Post, NAB, the University of Melbourne, RMIT, NEXTDC, Zoos Victoria, the City of Port Phillip, Moreland City Council, the City of Yarra, Citywide, Melbourne Convention and Exhibition Centre and Bank Australia. Having identified how much renewable energy we are all willing to purchase, we are challenging the market to supply at a cost-effective price. If the market responds effectively, we will see a new renewable energy plant constructed within the next two years to supply the group’s energy demands. The group is aiming to purchase more than 110 gigawatt hours of energy, which is enough to power more than 28,000 Melbourne households for a year. Participation in this innovative energy procurement project is just one of the many ways we are looking to reach our emissions reduction target. Our partnership with the Banksia Sustainability Awards has continued for many years and we continued to sponsor the Small to Medium Business Sustainability Leadership Award category. This category rewards work done to develop and implement industry-leading environmental and sustainability measures. In 2015, South Australian small business Kalleske Wines won this award for excellence in sustainability initiatives. Kalleske Wines uses ecologically and socially friendly farming methods, while its use of solar technologies makes it a leading net exporter of electricity in Australia. The Northgate (QLD) Green Team, led by Michelle Livaditis, is keen to recycle more. Australia Post has achieved a seventeen per cent reduction compared to the 2000 baseline and is on track to achieving the 25% reduction target by 2020. 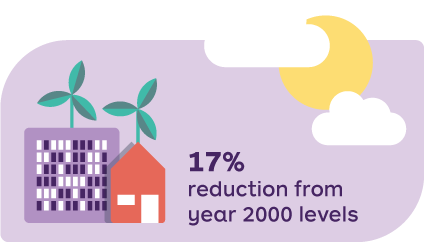 We will continue to drive energy efficiency and carbon reduction improvements across our 1,100 properties. We will make it easier for our customers to engage with the circular economy through our unmatched assets.